As the number of experimentally solved RNA-containing structures grows, it is becoming increasingly important to characterize the geometric features of the molecules consistently and efficiently. Existing RNA bioinformatics tools are fragmented, and suffer in either scope or usability. DSSR, an integrated software tool for Dissecting the Spatial Structure of RNA, has been designed from ground up to streamline the analyses of three-dimensional RNA structures. This new program consolidates, refines, and significantly extends the functionality of 3DNA for RNA structural analysis. 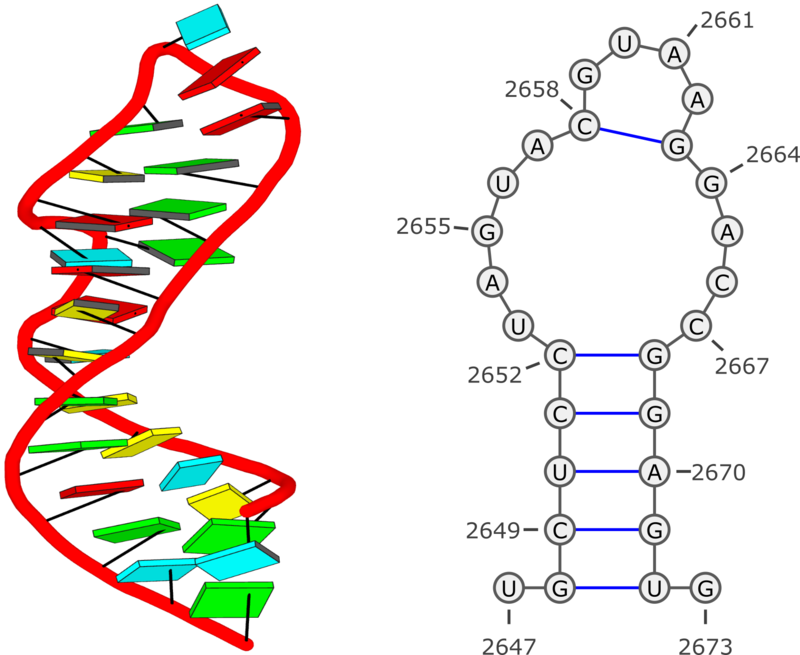 Starting from an RNA structure in PDB or PDBx/mmCIF format, DSSR employs a set of simple geometric criteria to identify all existent base pairs (bp): either canonical Watson-Crick and wobble pairs or non-canonical pairs with at least one hydrogen bond. The latter pairs may include normal or modified bases, regardless of tautomeric or protonation state. DSSR uses the six standard rigid-body bp parameters (shear, stretch, stagger, propeller, buckle, and opening) to rigorously quantify the spatial disposition of any two interacting bases. Where applicable, the program also denotes a bp by common names, the Saenger classification scheme of 28 H-bonding types, and the Leontis-Westhof nomenclature of 12 basic geometric classes. DSSR detects multiplets (triplets or higher-order base associations) by searching horizontally in the plane of the associated bp for further H-bonding interactions. The program determines double-helical regions by exploring vertically in the neighborhood of selected bps for base-stacking interactions, regardless of backbone connection (e.g., coaxial stacking of helices). DSSR then identifies hairpin loops, bulges, internal loops, and multi-branch loops (junctions), and recognizes the existence of pseudo-knots. 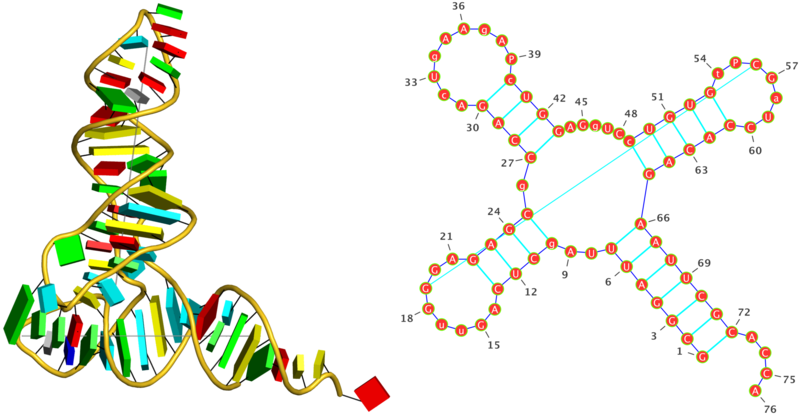 The program outputs RNA secondary structure in dot-bracket notation (dbn), connectivity table (.ct) and CRW bpseq formats that can be fed directly into visualization tools (such as VARNA). DSSR classifies dinucleotide steps into the most common A-, B-, or Z-form double helices, calculates commonly used backbone torsion angles, and assigns the consensus RNA backbone suite names. The program also identifies A-minor interactions, ribose zippers, G quartets, kissing loops, U-turns, and kink-turns. Furthermore, it reports non-pairing interactions (H-bonding or base-stacking) between two nucleotides, and contacts involving phosphate groups. A simple web interface and a comprehensive user manual are available. Supported by Dr. Robert Hanson, DSSR has recently been integrated into Jmol, a popular molecular graphics program. DSSR-related news and information can be found on the 3DNA homepage. Questions and suggestions are always welcome on the 3DNA forum. Give DSSR a try, compare it with similar tools in terms of usability, functionality and support, and see the differences! Note: please start a new topic with a more specific title; do not post directly below this announcement. DSSR has been made possible by the NIH grant R01GM096889 (to X.J.Lu). purposes, and it comes with ABSOLUTELY NO WARRANTY. common case would be B.A1689, meaning adenosine #1689 on chain B.
notation, please refer to the DSSR User Manual. Questions and suggestions are *always* welcome on the 3DNA Forum. 7 A.U2653 A.C2667 U-C -- n/a tW. tW-. type and backbone connectivity, and may contain more than one stem. pairs, with a continuous backbone. Other terms are defined as in the above Helix section. differentiate them from the stem numbers, which are positive. isolated WC/wobble pairs (negative numbers) to which they are linked. 2 A.A38 A.OMC32 A-c -- n/a cW. cW-. 14 A.5MC49 OP1-hbonds: "O2'@A.C48[3.13]" OP2-hbonds: "O2'@A.U7[2.68]"
18 A.C60 OP1-hbonds: "N4@A.C61[3.12]" OP2-hbonds: "O2'@A.1MA58[2.42]"
pseudoknots to get a fully nested secondary structure representation.